Study area, tracks and symbols show INSPIRE 2010 work. The cruise will start in Punta Arenas (PA) and spend several days at Chile Triple Junction (CTJ) and a nearby slope seep site ( ~45°55’S). We will finish the cruise with single-track mapping along the continental slope along the way to Valparaiso (V). Failure along parts of this slope may have contributed to tsunami caused by the February 2010 great earthquake, centered south of Valparaiso. Image courtesy of Scripps Institution of Oceanography. Download larger version (jpg, 2.3 MB). The Chile Triple Junction (CTJ) is a globally unique area where there is a confluence of both geological and biological aspects of processes that control bio-geochemical exchange. 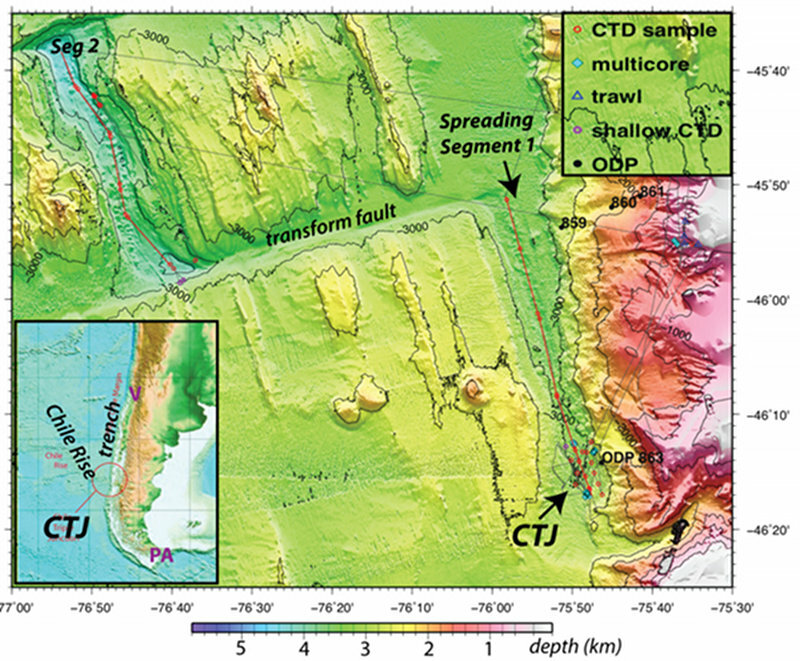 An oceanic spreading center subducts beneath the Chilean margin at the triple junction; slope sediments deform and produce methane and some are deposited in the axial zone of the southernmost part of the spreading center. The proximity of magmatically-driven hydrothermal venting and methane seeps on the adjacent slope provides a natural laboratory in which to examine relationships between and interconnectivity of these two types of deep-sea reducing ecosystems. The CTJ is at the confluence of the Pacific, Atlantic and Southern oceans, and so is ideal for investigating evidence for global-scale larval dispersal, potential for cross-basin population connectivity of vent species, and documenting similarities and differences of deep-sea fauna between the basins. Our brief multi-disciplinary study will fulfill several unfinished objectives of a previous collaborative NOAA-OE/UC, student-led cruise (INSPIRE - Chile Margin 2010) by providing detailed sonar and sensor mapping at 2-3 likely active vent/seep sites near the CTJ. Complete seafloor imaging capabilities will allow us to document the ecosystems, which are localized in selected sub-areas. The (bio)geochemistry of the systems will be documented with water samples (plume chemistry) and biological samples (micro-mega targeted). A small number of AUV Sentry dives can achieve complete sonar and near-bottom sensor mapping of axial venting. Based on the INSPIRE - Chile Margin 2010 results showing chemical signals indicative of venting in the water column, Sentry will map within an area closely surrounding the estimated seafloor locations of those vent-sources. These new data will be assessed immediately, and subsequent photo imaging runs will be designed to provide complete coverage of the area where we believe venting to be situated. The imagery of the vent community will be assessed immediately and high-priority sampling objective(s) will be identified and implemented. A single Sentry run at the known slope seep site will also be conducted. The goal of the INSPIRE project has been to conduct reconnaissance mapping of the Chile Triple Junction. This is the only place on earth where an actively spreading mid-ocean ridge is being subducted beneath a continent. Mid-ocean ridges support hydrothermal vents, which are areas where super-heated water, enriched in a range of chemicals that are otherwise quite rare in the oceans, is released from the deep seafloor. When certain of these chemicals (notably hydrogen sulfide and methane, but including – to a lesser extent – hydrogen and iron) react with the oxygen present in deep-ocean water, the energy released is harnessed by microbes that use it to grow. These microbes serve as the deep-sea equivalent of land plants, functioning as primary producers and providing the base of a complex food chain. The microbes involved in these reactions are diverse and can exist both in free-living forms and in symbiotic (prolonged but not necessarily beneficial) relationships with many animals, including tube worms, mussels, clams, and shrimp. The chemicals they harness for energy are in a "reduced state" and so hydrothermal vents are a form of "reducing environment," where chemical energy – harnessed by chemoautotrophic (deriving energy from inorganic chemical compounds) microbes – fuels a community of strange and unique animals. What will we find at the Chile Triple Junction? In every ocean basin, the fauna inhabiting vent-sites are diverse – from tube worms dominating many Pacific sites to shrimp being the primary "chemosynthetic" animal at many Atlantic vent-sites. In the Southern Ocean, "just around the corner" from the CTJ, abundant "Yeti Crabs" were recently found that are distinct, again, from those on the southern EPR. Whatever we discover is likely to include species completely new to science. Hydrothermal systems are not the only type of reducing environment. Sites of methane seepage, derived from massive methane deposits on the Chilean continental shelf, are another key and ubiquitous example of reducing environments. Where methane leaks out of vast gas hydrate reservoirs, a group of animals very similar to hydrothermal vent animals exist. They use the same chemical energy sources, yet to date few species found at seeps are also found at vents. The question is: why? The special setting of the Chilean margin provides a unique opportunity since there is a known slope seep site that lies in close proximity to the water column plume signals (hence, the underlying vent-sources) that we identified in 2010. For the first time, therefore, we expect this expedition to allow us to answer the question: Do vents and seeps host the same endemic, chemosynthetic species when the sites are not separated by huge distances (by definition, vents on mid-ocean ridges typically lie in the middle of ocean basins and, hence, long distances from cold seeps at ocean margins)? Another possibility is that these two habitats could be evolutionarily linked by a transition fauna, which is a hybrid fauna which is closely related to both vent fauna and seep fauna but is actually distinct from both. The autonomous underwater vehicle Sentry is designed to dive as deep as 6,000 meters (19,685 feet). It is powered by more than 1,000 lithium-ion batteries - similar to those used in laptop computers, though adapted for extreme pressures - which allow it to dive up to 20 hours. Image courtesy of Chris German, Woods Hole Oceanographic Institution. Download larger version (jpg, 1.8 MB). During this cruise, TowCam will be operated in concert with Sentry. As well as providing real-time imagery from the seafloor it is passing over, a novel adaptation for this cruise means the TowCam pilots will also have the opportunity to attempt sampling of any biological communities we find at any vent or seep sites. Image courtesy of Daniel Fornari, Woods Hole Oceanographic Institute. Download larger version (jpg, 908 KB). Our most sophisticated tool for this expedition is an autonomous underwater vehicle (AUV) called Sentry. 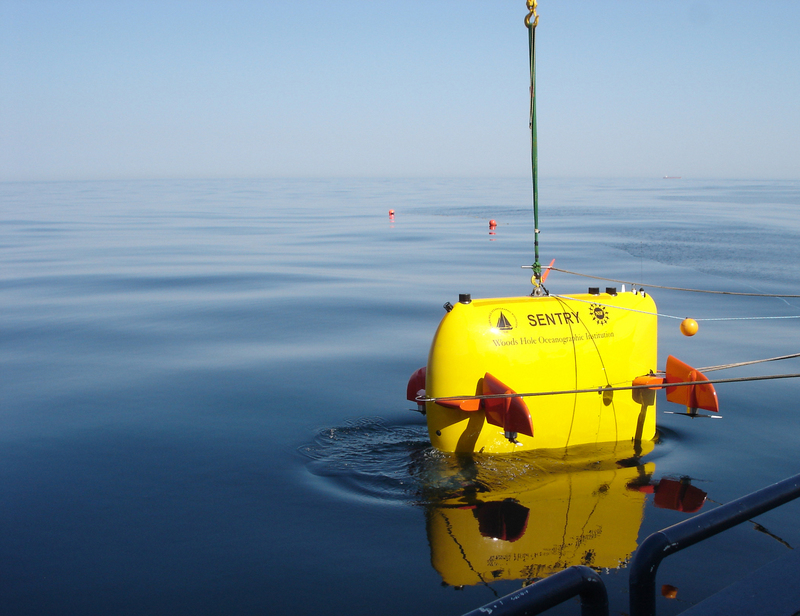 Sentry is the latest vehicle to enter the US National Deep Submergence Facility, replacing the ABE vehicle that was lost on our prior expedition to this area in Spring 2010. 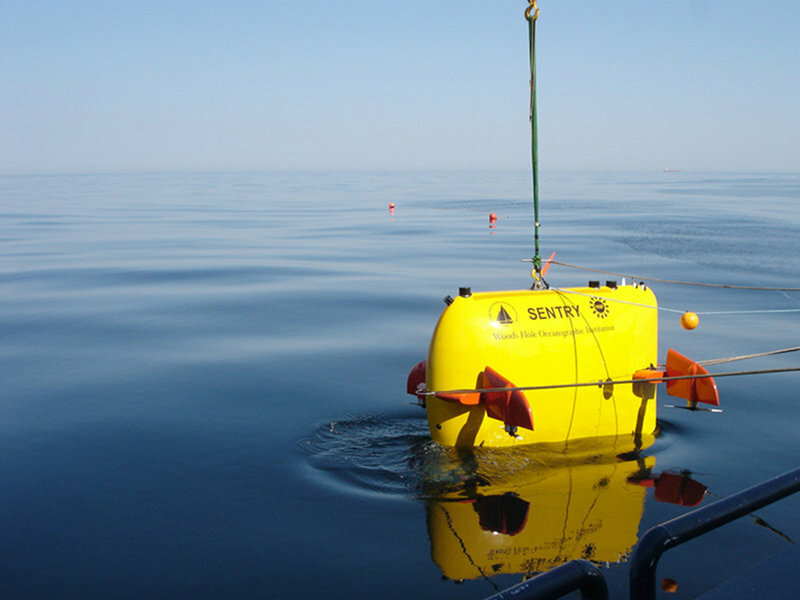 Like ABE before it, Sentry will be deployed from the ship and programmed to swim in regular patterns over the seafloor measuring properties in the water column and gathering information about the underlying seabed. Read more about how we will use Sentry. In places where the strongest plume signatures are detected, we will re-launch Sentry to study the seafloor in ever greater detail up to and including photographing the seabed. In parallel, we will also use a towed camera system (TowCam) to image the seafloor, both between Sentry dives (when Sentry's batteries are being recharged) and even during Sentry dives when both sets of operations will be conducted in the same area. While TowCam is less wieldy at the ocean floor, because of the 3000m of cable that we have to drag through the ocean to operate it, one particular potential advantage in areas of greatest interest is that TowCam can provide live images from the seafloor in real time as we are conducting our survey – i.e. we will know the moment TowCam passes over any new vent or seep animal communities. Further, TowCam also has water samplers and even a new slurp sampling capability which means that we will be able to collect water samples and perhaps even animal samples themselves from any new sites we locate using this device. 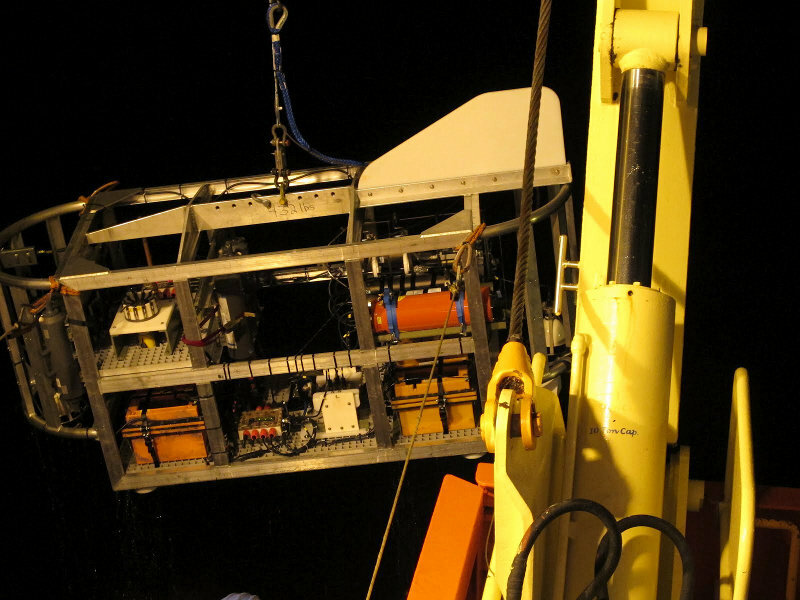 Primarily, however, we expect to collect animals using more conventional devices and we have both small trawls with which to collect animals living at and near the seabed as well as a multicorer – a mud sampling device – that will allow us to collect any sediments and the animals that live within them. All told, there will be a lot going on in a very short space of time when we arrive on station toward the end of April – who knows how many new findings we'll have to report by the time we disembark in Valparaiso at the start of May?